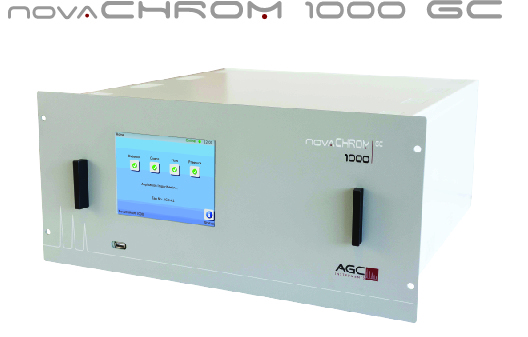 Introducing the AGC NovaCHROM 1000 GC System using our world-famous Discharge Ionisation Detector (DID). This type of GC is used to measure trace levels of impurities within a sampled gas across a wide range of applications from ppm down to ultra-low ppb levels. Impurities such as H2, Ar, O2, N2, CH4, CO, CO2, N2O, C2H2, C2H2, C2H2, Kr, Ne, Xe, CF4, C2F6, SF6, SiH4, SiH3Cl, SiHCl3, SiCl4, SiH2Cl2 …etc. are some typical impurities that can be measured, the list is exhaustive and please contact AGC Instruments if you have a specific impurity and we can examine this further and devise a solution. Using an Industry proven detector, the DID which uses Helium as a carrier gas allows great flexibility and a wide range of applications to be uncovered. The NovaCHROM family is an on-line GC solution using an interactive 6.5” colour touch screen display and avails of our Electronic Flow & Pressure Management System. All parameters and readings are easily viewed which ensures straightforward functionality and accessibility with minimum training required. The GC is easy to install & set-up. Depending on the design configuration, the 19”/5U configuration allows it to be retro-fitted into a standard Industrial Rack Cabinet. We offer many unique features including the AGC designed column ovens where each column is housed in its own independent temperature-controlled oven. This design, which is unique to AGC, means that temperature control and stability of the column is first in its class. All fittings on our NovaCHROM 1000 GC are 1/8” VCR compression fittings which mean all our pipework (1/8” or 1/16”) have excellent seal rates and expect zero leaks. Coupled with our NovaPURIFIER Helium Carrier Gas Purifier & our TrendVision PLUS Software, a perfect solution will deliver the results and standards that you as a customer would expect. For more information NovaCHROM 1000 DID GC please contact us directly.